Winegrowers father to son since 1620, the Humbrecht family has cultivated their vines in the great terroirs of Alsace. 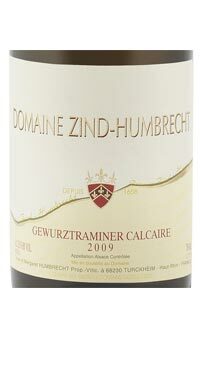 Domaine Zind Humbrecht was founded in 1959, when two wine growing families united. Today, the domaine has 40 hectares of vineyards in five different villages in the Haut-Rhine region of Alsace. After years of grape growing experience, it was possible to identify certain Alsatian grape varieties as particularly suited to specific soil types and micro-climates. Zind-Humbrecht’s dedication to terroir expression guides all biodynamic practices in both the vineyard and the winery; which include extended pressing cycles, abbreviated clarification cycles to retain natural yeasts and proteins in the must, plus natural malolactic fermentation, which sometimes last a year, and extended ageing on the yeast lees. Bright yellow color. There is no doubt on the grape variety here, there are plenty of subtle floral and spicy aromatics. Cinnamon, vanilla, rose petal, lily and litchi on the nose. Despite an earlier harvest than usual for these vineyards, the palate shows good weight, medium sweetness, amazingly controlled by a firm acidity, typical of this vintage. The palate echoes the intense aromatics of flowers and confectionary as well. It is a creamy, viscous and sweet wine that is not cloying, only satisfying and incredible with cheeses. Overall, it is an elegant wine with restraint varietal characteristic. The palate shows the typical 2014 freshness, adding passion fruit, pear peel, honeycomb and grapefruit pith to this aromatic tableau. In between, seams of pepper and honeysuckle are highlighted by bright, zesty acidity. The wine offers an irresistible contradiction of structure and enthusiasm. 93 points.